The Complete Handmade Design Toolkit 95% Off! This bundle brings you a complete arsenal that will help you achieve the coveted handmade look in your creative work. We’ve teamed up with some of the world’s top designers to bring you the best resources for a staggering 95% off. These items are the result of hundreds of hours of work, and give you a professional quality set of tools, ready to use right out of the box. Hand-drawn design could not be more in demand. However, a lot of us designers are struggling to master the handmade style. We may be experts in Photoshop and Illustrator, but unless we invest years in learning calligraphy, sketching or any other type of craft, it’s hard for us to produce the hand-drawn style work that our clients are demanding. Handmade design has gone beyond just being a trend, it’s now a necessity. We’ve listened to our community. We created this bundle to equip you with the tools needed to perfect the handmade style in your work. This collection features your favourite designers including Make Media Co, Lisa Glanz, Retro Supply Co, Creative Couture, Vintage Design Co and more – ensuring exceptional quality. The products in this bundle are the result of hundreds of hours of meticulous, lovingly crafted work. By getting your hands on this collection, you’ll have the best resources from top designers entirely at your disposal. These are the best handmade tools that our team has ever worked with. These resources took hundreds of hours to source and capture, from historically accurate brush markings, to authentically captured gold leaf surfaces. Each pack relied on the expertise and experience of the designer, and every item was carefully scanned, captured and recreated into an easy to use, digital format. The result is that you get professional grade design tools right out of the box, backed up by expert pdf guides, support and functionality. This collection is a complete creative toolkit for any designer looking to nail the handmade aesthetic. 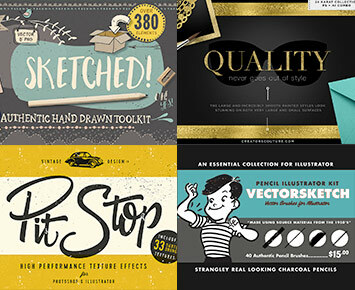 It features 13 hand-drawn fonts, vectors, backgrounds, patterns, brushes, graphics and more. Included also are several extensive effects packs featuring watercolours, gold leaf and felt. Whether you are looking to complete a handmade project on a tight deadline or spend time exploring the possibilities of mixed media design, these ready-to-use resources have you covered. This bundle includes our extended license, making it even more valuable for you. You’re able to use these resources in wider, original designs available for resale, as well as personal and commercial projects (full deals further down this page). 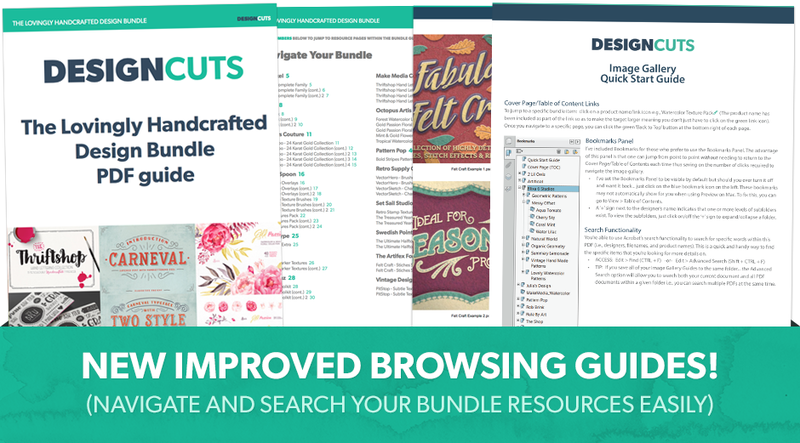 This bundle is huge, and you can see an overview of all the incredible handmade resources below. We definitely recommend scrolling down this entire page, as it’s the best way to see the vast collection of resources on offer. With over 380 hand drawn elements, this little gem will speed up your workflow and make a great addition to your design resources! It’s jam-packed full of versatile illustrations all lovingly created for that authentic hand drawn look. This toolkit is fantastic for a huge variety of projects, logo and branding design, posters, blog posts, invitations, stationery, a quick flyer, endless background enhancements – the possibilities are endless. • 52 x Arrows – always come in handy! 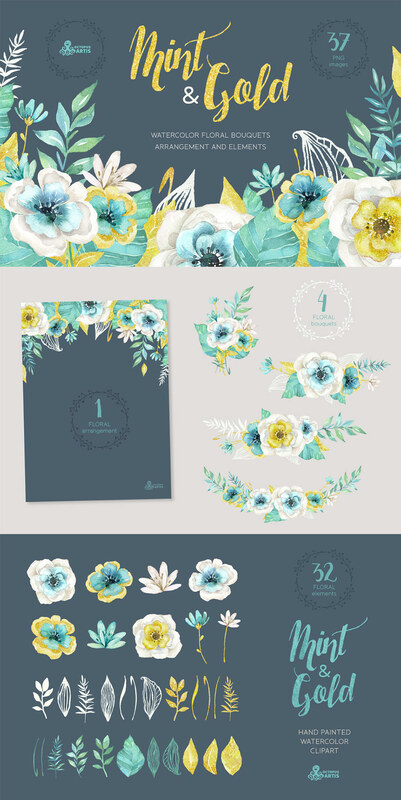 • 52 x Floral & Decorative elements – can never have enough of those! • 52 x Shapes – pick your shape, add some text and voila! 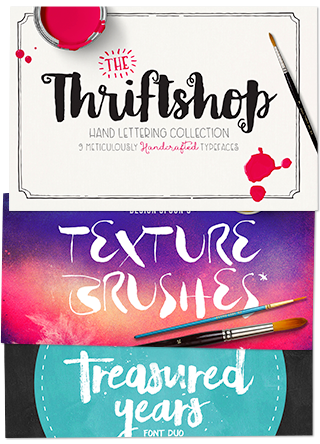 Presenting the Thriftshop Hand-Lettering Collection – an adorable, hand drawn and hand painted font family, designed to give your projects an authentic, hand lettered look. 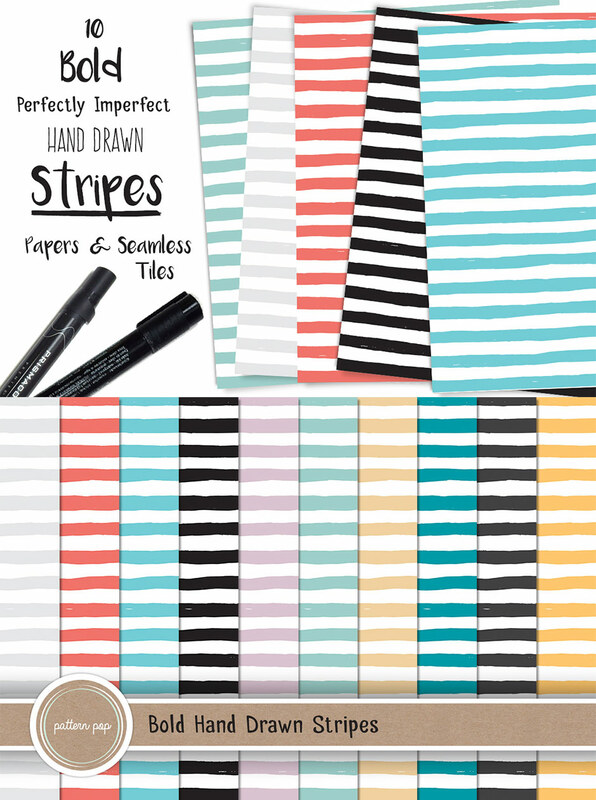 Perfect for: Typography projects, branding, apparel, greeting cards, coffee mugs, tote bags and so much more. Software compatibility: Any Adobe Software (Photoshop, Illustrator, Elements, InDesign, Etc. ), GIMP, Corel Draw, Inkscape or comparable vector-editing software. PitStop is kit to help you get those cool effects easily. It features 33 handmade vector textures. 10 of which are made by vector texture tutor Ben Stafford. What’s even better is that PitStop comes in two flavours. PitStop for Photoshop and PitStop for Illustrator. PitStop for Photoshop: Open up the .PSD and drop your work into the smart object and get access to all 33 vector textures instantly, split into 3 different groups which can be easily colored. It also adds rough edges to your work, that can be adjusted to suit your style. PitStop for Illustrator – Install the 33 graphic styles and the vectorize action and you can add subtle textures to every part of your artwork. Because these are subtle textures then you can add them to shapes as well as text without your computer coming to a complete stop. Make sure you have a copy of your work next to the one your working on for color reference as the effect has to be applied in black & white. 33 Vector Textures – If you don’t need any of the above, then all 33 vector textures are supplied as individual .AI files saved down to CS3. Instructions – You’ll get separate .PDFs for each PitStop walking you through the process of how to place your work and edit the effect. This is a set of 46 high quality texture brushes for Adobe Photoshop. These brushes are very versatile. They can be used for: editing photos, making photo collages, creating your own custom background textures, spicing up your typography and digital paintings and illustrations. Each bonus texture comes in two formats: transparent .PNG (more detailed, 600 ppi) and .EPS (easily re-sizable). Vintage Overlays is a set of 40 transparent .PNG textures that can be used in a variety of projects such as posters, photos, illustrations, typography art, postcards, flyers, T-shirts and many, many more. If you want to give your design that perfect vintage look, Vintage Overlays are exactly what you’re looking for. Software compatibility: Photoshop CS3and newer. PNG files will work with any graphic software. This is a set of 32 handmade textile textures that can be used in a variety of projects such as posters, photos, postcards, flyers, T-shirts, typography and many, many more. Transparent backgrounds allow for quick and easy change of color and application. Software compatibility: PNG files will work with any graphic software. I had a lot of designers loving the InstaGlam styles, but wanted some smoother and less patterned styles. After much hard work and careful tweaking, I’m proud to introduce the all new 24 Karat Gold Timeless Collection. What makes this style collection unique and special? • Designed with maximum versatility, apply them at 100, 50 or 25% scale for ultimate refinement! • No Smart Objects: Work within your OWN document size and resolution! • Your text stays LIVE with effects applied! Very large collection of 80 rough halftone textures in different shapes and sizes such as corners, edges, gradients, pages and stains. Raster and vector format included. • A .PDF document with thumbnails and file names of all the objects. • The vector files are in .AI format which can be opened in Illustrator CS1 or newer. • The raster files are transparent .PNG files. The smallest objects have a resolution of about 2400×250 pixels and the largest ones are about 6000×4650 pixels. Software compatibility: Ai files for Illustrator CS1 and newer. PNG files will work with any graphic software. Give your design that retro finishing touch with these handmade stamp textures. The Treasured Years is a set of 2 hand-painted fonts, designed to combine perfectly and allow you to create beautiful typography quickly and easily. With a very distinct bold dry-brush effect, this font set is perfect for creating hand-lettered quotes, logos and printed designs with a rustic & personal touch. Also included is a set of 24 bonus ornaments, designed to give your text that extra touch of detail & attention. • The Treasured Years Script is a set of lowercase characters which includes a large range of punctuation glyphs, numerals, and supports international languages. Stylistic alternates for several key characters are also available, you can access these simply by switching between upper & lower case glyphs within this font. • The Treasured Years Display is a supporting set of upper-case characters which includes basic punctuation, numerals, and supports international languages. • The Treasured Years Ornaments is a set of 24 hand-drawn elements including flourishes, swirls, stars, hearts, paint-splatters, underlines & arrows. 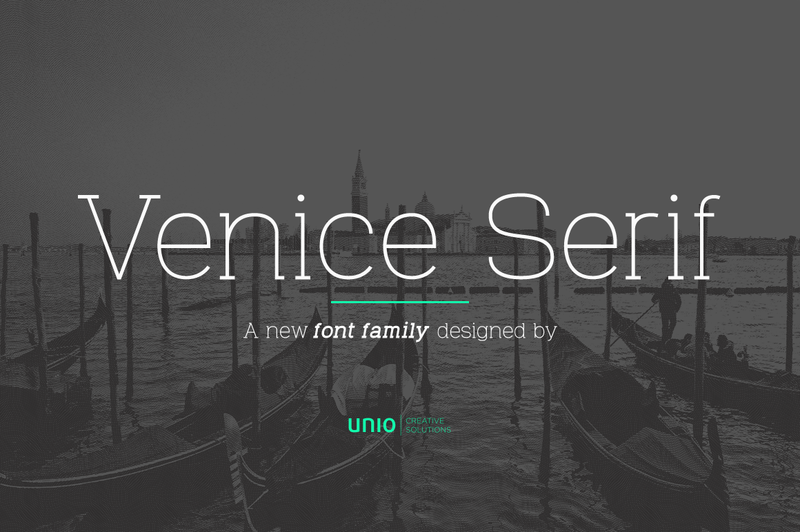 • TTF and OTF files are included for all 3 fonts. Traditionally, if you want to create authentic charcoal and pencil effects digitally, it happens in Photoshop. The only problem is then you’re stuck with artwork that’s hard to resize. Or worse yet, you send it to the printers, and you get back fuzzy (or pixelated) work. That’s why we created VectorSketch. It’s a deluxe package of 40 charcoal and graphite based brushes. 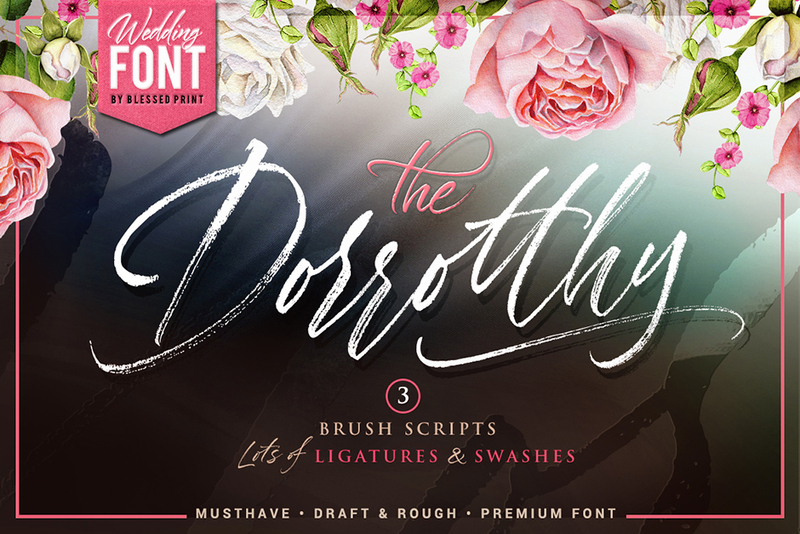 • 40 historically inspired charcoal pencil brushes. Create illustrations like 1950s commercial artists! • Gathered a huge library of commercial art from the 1940s and 50s. • Studied how these pens perform in the real world. We paid close attention to things like how the ink pools when a nib pen first touches the paper. How brush strokes widen as pressure increases and decreases. How the end of strokes terminate. • Carefully recreated these characteristic in vector form. We used real commercial art samples, strokes we created with brush and nib pens and even created ink strokes with the pen tool using historical reference material. You see, most Adobe Illustrator brush packs are made by scanning pen strokes, auto tracing them and making them into brushes. The result is hard to use brushes that give less than stellar results. Scott Fuller and Dustin Lee spent over 40 hours compiling material, studying the best examples of commercial illustration work, recreating and refining brushes and then testing them by creating real artwork in the classic style of 1950s illustrations. A beautifully, colourful, hand drawn set of bold tripe papers and seamless tiles, perfect to be used as backgrounds, overlays or in your web design projects. Software compatibility: .AI files work in Illustrator CS2 and newer. JPG files will work with any graphic software. Most of us have fond memories of visiting carnivals during our childhoods, and even now we still love the fun and magic any carnival visit brings. Let us Introduce Carneval – A double cheerful font, inspired by the carnival atmosphere. It comes with 2 styles that complement each other wonderfully, and help you create amazing carnival themed designs. Language Support: Baltic Windows, Windows Vietnamese, Eastern Europe, English, US, German, Swedish, Hungarian, Italian, Spanish, French, Filipino, Dutch, Romanian, Albanian, Basque, Bosnian, Catalan and countries that use the Latin alphabet. A fluid, handwritten typeface that gives your designs a personalised feel. Perfect for invitations, posters, social media graphics and many more. Add some real red markers to your designs! These textures were scanned in at 2400 ppi, then cleaned and gently sharpened. I then erased the boring white pixels, separated the layers and resized to 300 ppi. And that’s how Hej! was born. Felt is no longer just for kids – it’s for designers too! This massive pack of felt styles and stitch effects is the first and only one available for Photoshop. No longer will you have to spend hours working to achieve that perfect look. With the help of the Artifex Forge this is now all only a few clicks away! This pack is hugely versatile and can be used to enhance any of your design themes – Christmas, Valentines, arts & crafts, nursery and many, many more. Plus, with its eye-catching and realistic hand-crafted finish, it’ll make any design stand out and just look plain awesome. These work with one easy click. You can apply them to text as well as bitmap and vector shapes. They can be used for backgrounds too. The shadows, gradients and depth can be adjusted individually after application. They are supplied in 32 colors. To create your own colors, apply an adjustment layer. This combines a set of 10 stitch brushes and a layer style, which adds the realistic texture and depth. To use, simply apply the style to a layer, select a brush, adjust its size and draw! You can change the color, depth and shadowing after application. Supplying the stitch effect this way makes it super-flexible for the user. A 5472 x 3647 pixel piece of felt texture in .TIFF format. This offers a great background for you to start your design. Software compatibility: Photoshop CS5, CS6 and CC only. LeOsler is a decorative, fun, handwritten font that includes the Latin, Greek and Cyrillic alphabets, and can be used in a wide range of languages. Its OpenType features include ligatures for all repeated characters in upper & lowercase, contextual alternates for all supported alphabets, 4 ampersand alternates, scientific superior/inferior figures, fractions, etc. LeOsler also offers a set of icons that will provide a much more personal look to your work! Available in Regular and Light weights, and Rough and Stamp styles, for a perfect match with the font styles. This set of high quality, hand painted watercolor floral graphics is perfect for wedding invitations, greeting cards, photos, posters, quotes and more. • 6 x Bouquets in .PNG with transparent backgrounds and .JPG (white backgrounds). Bouquet sizes approx. : 12-11in (30-28cm), 3600-3300px. This set of 12 high quality hand-painted watercolor floral elements (leaves, grass, herb, foliage etc) and floral arrangement in hires. Perfect for wedding invitations, greeting cards, photos, posters, quotes and more. 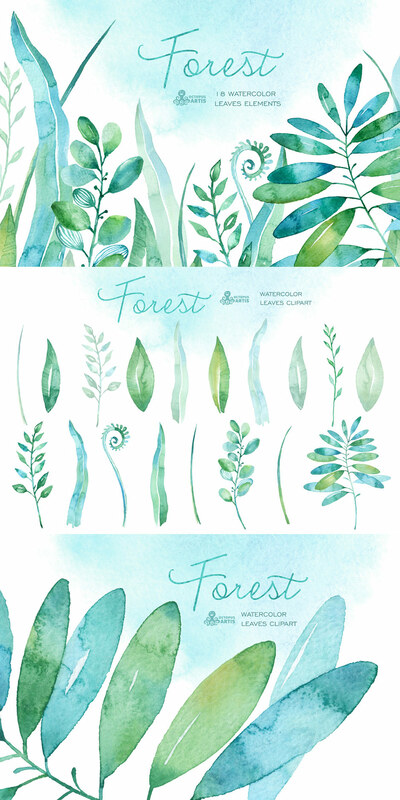 This set of 18 high quality hand painted watercolor floral elements (leaves, grass, herb, foliage etc) in hires. Perfect for wedding invitations, greeting cards, photos, posters, quotes and more. This is a set of 37 high quality hand painted watercolor floral cliparts. Mint and gold color palette. Perfect for wedding invitations, blogs, greeting cards, photos, posters, quotes and more. 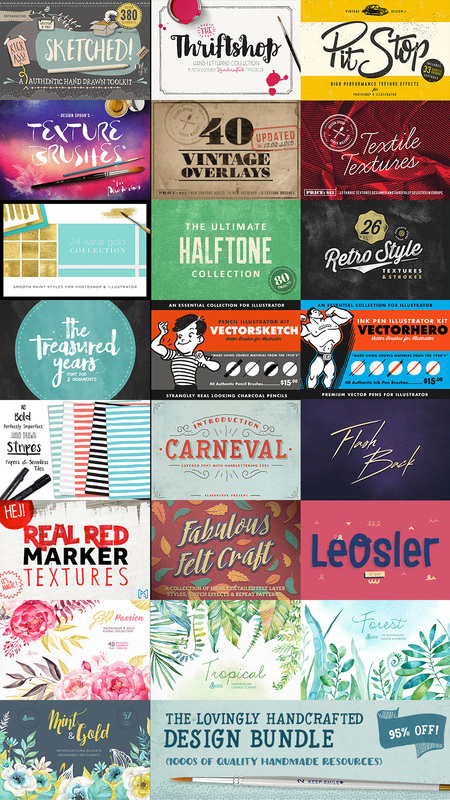 This bundle contains a huge collection of lovingly, handcrafted resources, including 13 best-selling versatile fonts, hand-drawn toolkits, vector brushes for Illustrator, textures, brushes, and effects packs, perfect for any graphic designer and digital creative. We've focused on quality and usefulness with this bundle. These items are already hugely popular at full price. This is an exclusive chance to own this collection of handmade resources for this kind of price. File size is approx 7.14GB unzipped (split into 17 smaller parts) for easier download. A single download option is also available. This looks really amazing! … and I missed it, too. I would like to buy this as well next time you offer these Bundle. Can you please add me to that (long 😉 ) list waiting for the The Lovingly Handcrafted Design Bundle. Thanks for the comment on this one! Unfortunately we no longer re- run our bundles so this one is completely finished so there is no longer a waiting list in operation- I am so sorry to disappoint you about this! I hope that helps Sabine but please let me know if you have any questions! Thanks for the comment on this one but I am afraid that this bundle hasn’t been available for quite some time now as this one expired in Oct 2015 so you missed out on this one by quite a bit! Thanks for the comment! This deal has actually finished so whilst we are so happy for you to share the DC word Tony- people may be disappointed when they realise they cannot purchase The Lovingly Handcrafted Design Bundle if you share this particular deal! However we would definitely love for you to spread the word about Design Cuts in general :).I have popped you an email about this though and thank you so much for your lovely words! Hi there will you be running this deal again? Thanks so much for commenting on this one! This one was really popular and we have been getting a lot of requests for it to be re- run so i am pretty hopeful it will be featured again as a re- run really soon! I have added you to the master list for this one Peter so rest assured, if it goes live again, I shall be in touch to let you know. I hope this helps, and please don’t hesitate to contact me should you have any other questions. I would like to buy this as well next time you offer these together. Can you add me to that list waiting for the The Lovingly Handcrafted Design Bundle. Thanks for the comment on this one! That is not a problem and i have added you to the list for this one. Rest assured if it goes live again i shall be back in touch to let you know so you don’t miss out again! I too missed the deal, and would love to be able to buy it. Need it for a project starting tomorrow. Can you send me a code to make the purchase? I am really sorry but I’m afraid that the Lovingly Handcrafted Design Bundle is now well and truly finished, so I won’t be able to set you up with this. However, sometimes we do re-run an older deal as a special bonus, in conjunction with a new deal. The best way to ensure that you don’t miss a deal is to join our free newsletter, by signing up at http://www.designcuts.com. Unfortunately I have missed this deal, but I really would like to buy it. Is there any chance that it will be available again? I hope it helps, and please don’t hesitate to contact me should you have any other questions. I’m always happy to lend a hand! Will this package be available again? I have sent you a quick email that should get you up and running, I hope it helps! I would like to purchase this deal, today, and I missed your deadline. May I please, please still get it today? Hello, will this bundle be available with your birthday deals? I meant to buy it yesterday, but the day got away from me. Thank you!! I was coming to buy this bundle this morning before the big birthday surprise and to my surprise it is gone. Then I thought I would just be able to get it on the birthday deals page and it isn’t there either. So anyway to get this one? I have sent you over a quick email that should help you out with this. Me too! Can you please send me the info to download this bundle? Thanks! I have popped you over an email which should assist! I’m so pleased you hear you are loving your new resources, if you ever wanted to share some of your designs featuring these items we would love to take a look! Thanks again for your kind words, Chantalle! If there is ever anything I could assist you with please do get in touch. I’m always happy to help! Oh my gosh… you all are killing me! I haven’t seen one bundle of art/fonts/etc that I haven’t liked. I plan on being broke very soon! LOL Just kidding! Keep up the amazing work! I love you guys! I’m so stoked to get started “playing” with this. Designer love… that’s for sure! I Bought it for the PEONIES. OK, I bought it for lots of other stuff too. I can hardly wait to explore what parts I can actually use in my Corel PSP and Draw. I love Love LOVE!! The Artifects Forge’s felt, and the gold foil by Creators Couture, but not enough to sell my soul to Adobe. I wish the designers could include JPG or PNG files for the rest of us! It may not be quite so magical, but it would work. Thanks again for your kind words, we really appreciate your support 🙂 If there is ever anything I could assist you with please do get in touch. I’m always happy to help! Thanks for commenting about this and rest assured i can help! I am so sorry you are having an issue with locating your pdf guide- i have sent you over an email which should help though! Please do let me know if you have any issues though Alex! Same problem. Appreciate the bundle but can´t find the PDF-Document. I have sent you a quick email that should have you up and running in no time! Great! Thanks!! I´ll have a look soon!!! I also just sent a ‘contact’ form.. I am needing a PDF/Image Gallery as well, please!! Thanks for the comment- I believe Ben has been in touch with you about this but if you have any questions please do let me know! Stunning and exquisite collection as always! if you guys plan to run a vintage or font bundle in the future :)? Thanks for the awesome comment- we are so happy that you are enjoying this one! Please always send over any requests you have- we love to get feedback of resources you would like for future bundles :). I have added these to the list for sourcing and hopefully we will be able to get them featured in a future bundle for you Siva. So unfair. The longer I scroll this deal the more I know I need it. Thanks for making such amazing bundles. I was looking at a font on another site that was $29. One Font! I don’t know how you do it but I know every part works because I bought the Mammoth Bundle and was plenty satisfied. Looks like my tool box just got a little bigger. Thanks for such an awesome comment and we are so pleased that you are liking the look of this one! We are so happy that you like the value our bundles give you as we always try and ensure that our community are getting good value for money. If you do have any other questions or need help in any way, please do let me know. I am always happy to help :). wow, you make these deals hard to resist! Every time I say I’m not going to buy one, there is something (or many things) I just can’t live without! I love everything, but am already trying to think of ways to use Thriftshop! Just a fabulous collection! actually, i had zero balance in my paypal account when purchased this deal. and here i am giving you another 5 stars rating, and encourage whoever still not sure to purchase this AMAZOME deal to finally hit the action button (whichever state you re right now), this investment would easily pay itself ten times. Big love to you too, Vinsensius. Have an amazome day! Thank you so much for your kind words, I’m really pleased to hear you are liking the Lovingly Handcrafted Design Bundle 🙂 Were there any particular resources that stood out as favourites for you? Thanks so much for such a lovely comment! Although we are proclaiming a massive ‘Hail to Jeremy and the rest of our awesome community for purchasing this bundle’ :). We are so pleased that you are enjoying this one- please do feel free to share anything that you create using your new resources as we would love to see what you are working on! Normally you re-run a past deal alongside…is there one? I’m looking on mobile/tablet as I’m away on holiday but want to check in and make sure I’m not missing out(!) – couldn’t see any re-run deal, unless it’s because I can’t see on my iPad? Thanks for commenting- that is serious dedication for DC- checking in on your holiday! We actually don’t have a re-run in conjunction with this one so rest assured you are not missing out! I hope you are having an awesome holiday and are away somewhere nice :). This is lovely! Quick question though…Are all of these new assets not previously offered in recent bundles? I’ve bought a number of bundles recently and I can’t remember if I already have some of these assets already. 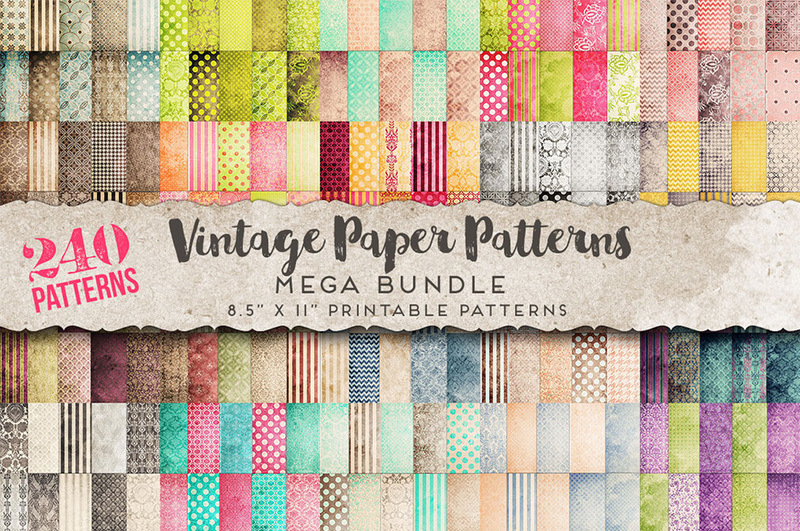 Thank you so much for your comment, I’m pleased to hear you like the look of this bundle! Were there any particular items that stood out for you? It’s a little bit scary :), but some of the items are exactly what I was looking for right now. Thanks for this super deal. Thank you so much for your comment! It’s great to hear that the Lovingly Handcrafted Design Bundle was able to tick a few items off your wishlist! Were there any particular resources that stood out for you? Thank you so much for your purchase, I hope you’re enjoy getting creative with your new items! Please don’t hesitate to contact me should you have any questions, I’m always happy to help! Ah! That darn payday wait! Not to worry, if you do need any help getting set up with the Lovingly Handcrafted Design Bundle please do get in touch and I will happily assist you! Great bundle. Reminds me of a 160 Megabundle from CreativeArtMarket I recently got for a similar price. Keep up a good work, cheers! Thank you so much for your comment, I’m really pleased you like the look of this bundle! You are more than welcome for the bundle and we hope you got lots of use out of it! Please do feel free to share anything you create as we would love to see what you create! Another insta-buy. Loving the patterns from Lisa and swooning at Octopus Artis. Thanks again DC! this is just unbelievable. you guys have nailed it every single time. i’m with you guys. keep the bundle going. i’m starting a designcuts savings just for all these right things. Thank you so much for such an awesome comment and for taking the time to give us your feedback! I have a feeling that you are not alone in having a DC savings account! Wow we are always so blown away to think that people factor our bundles into their outgoings- we are truly grateful for your support :). Thanks so much for such an awesome comment! I hope you will be happy with your purchase! Thank you so much for participating in our survey and the items in this bundle definitely came about from the feedback we received- we love to know that our bundles have resources in them that our community want to work with :). We are super happy to know that we have added a few new items to your collection as well! Please do share anything you create using your items Emily as I would love to see what you design! thanks guys for another great bundle. but most of all, a big thank you for one download file!!! been in pain with a pinched nerve and unable to design, so inspiration is very appreciated. Oh no that is awful to hear about the pinched nerve- you poor thing! I have unfortunately suffered the same a few years ago and it is not pleasant. The whole team is sending you our best wishes for a speedy recovery! I am so pleased to hear that you are happy with this bundle and it is inspiring you :). Please do let me know if I can help in any way Mindy! I’m with Gail. I want that Pit Stop font!! Love this bundle, BTW. Kudos, guys! Thanks for the comment! We are so pleased to hear that you are loving the bundle! I am so sorry but unfortunately Pit Stop isn’t a font but instead this is hand lettering that Ian Barnard created for the previews. Okay I’m drooling! Y’all should figure out a way for us to send a wish list to our loved ones or do gift certificates or something! I may buy this, but it looks like the fonts for the words “Pit Stop” and “Gasoline” are not included correct? Are those hand lettered? If not, would you mind sharing what fonts those are? Thx for more great stuff! Hi Gail, unfortunately they aren’t fonts, I hand lettered those words specifically for the Pitstop cover and Gasoline example. Thanks for the comment and be careful of drool near the keyboard- it can clog it right up as we’ve learnt at DC HQ looking at these items ourselves! I hope you have seen Ian’s comment about Pit Stop and Gasoline and I hope it hasn’t disappointed you too much! argh! and YAY! YAY wins – what a fantastic bundle, thank you!! We are so happy to hear that you are enjoying the bundle and i hope you get loads of use out of the resources! BOOM! And just like that… it’s mine. Again. Oh, and the fonts… the fonts… yummmmm. Boom! Thank you so much for getting in touch with your kind words and for your purchase! All thanks go to all the amazing designers for allowing us to feature their awesome work in this deal :). Absolutely love the name! However, I still need to get used to the fact that Tom’s now wearing his superhero mask and cape all around the office, what have you begun, Liv!? !!! Thank you thank you thank you guys. Maybe you followed my comments as to what I want to see in the bundle, may be not, but this one is right up my alley. Also I was swooning over Octopus Artis works just yesterday, thinking that I should have let you know in the comments that I would love any of their graphics and BAM! you are mind readers. Thanks guys! Love it! Keep up your awesome work! I’d like to think it’s a lovely combination – on one hand we have a really great community that is always helping us to shape our bundles by offering their suggestions of what they’d like to see (which we always take on board so thank you so much for taking the time to get in touch with your suggestion!). On the other hand, Tom is actually a genuine, bonafide mind reader! We don’t know how he does it! Worth it for the Retro Supply Co. brushes ALONE. Thanks for your kind words! I’m really pleased you’re liking the VectorSketch brushes 🙂 We can’t wait to see what you create using them!